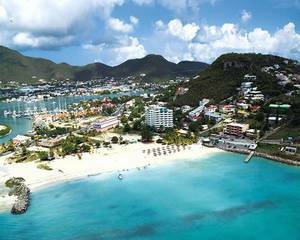 At this small boutique resort, you'll discover the best of Sint Maarten/St.Martin at your own pace. Delightfully Dutch and fantastically French, this island of two nations has glorious beaches and much more. Located on beautiful Simpson Bay, The Atrium Beach Resort offers a gymnasium and breathtaking views of the Caribbean Sea, blue lagoon, and rolling hills of Sint Maarten. The resort amenities include a small swimming pool, Jacuzzi, gymnasium, hair salon, beach bar, and restaurant. Within walking distance is a shopping center, bars, restaurants, a movie house, and a watersports/scuba diving center.